Take your Fighters and Bombers HIGH ABOVE The Battlefield! 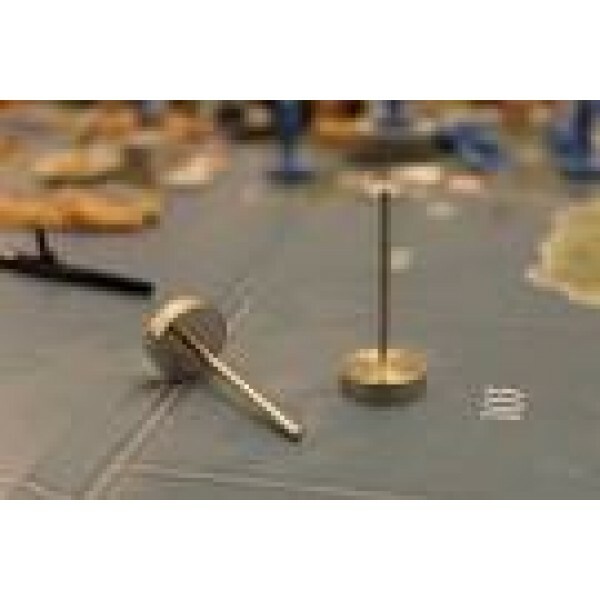 Are you tired of those little plastic fighters and bombers cluttering up your game board? Do you want to add a dynamic factor to your game? 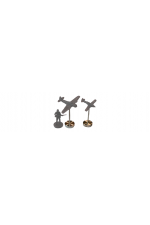 Free up space on the board and have all of your air-power at your finger tips; and in the skies, rather than piled up with your ground units; with I Will Never Grow Up Games' Metal Flight Stands! These flight stands are crafted from solid polished stainless steel. Extremely high quality, they will not break or even bend easily! Each set of flight stands contains 10 x 25 mm tall metal flight stands and 10 neodymium rare earth magnets. Select the 5 or 10 set option(s) and save! Pre-Orders expected to ship out on or about the 2nd week of April. The base size matches the standard Axis and Allies infantry unit base at 12.5 mm, meaning it will sit perfectly on those ubiquitous plastic multiplier chips. The base is 4 mm thick for extra weight and balance to help keep your units standing upright! 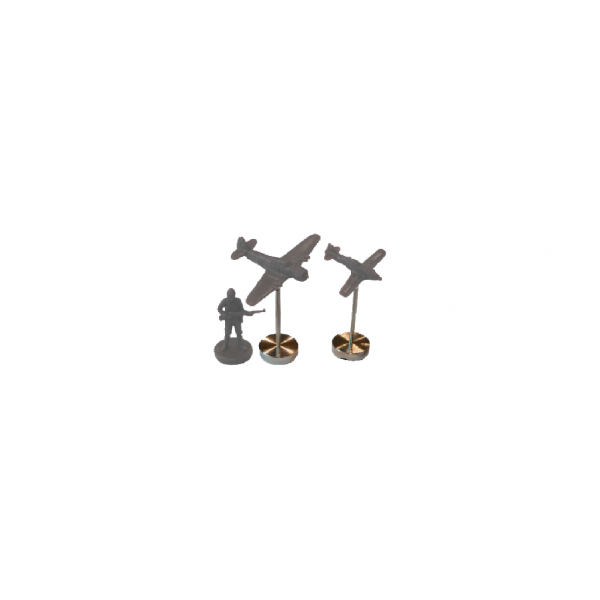 Metal flight stands come in two heights; 25 mm and 35 mm, from tip to base, so your planes will fly above standard infantry units on your game board. 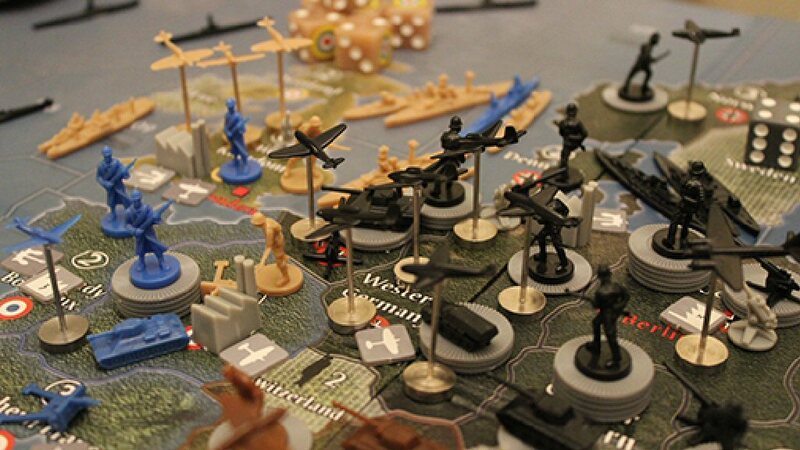 Designed to be suitable for use with a variety of historical based board games such as (but not limited to) Axis and Allies, Fortress America, Global War 1940, The War in Vietnam as well as a variety of sci-fi board games such as Rebellion, and more! Solid Metal Construction - Won't bend or break like plastic does! Heavy Base - Helps prevent your pieces from falling over! Space Saving - free up valuable board space, ground units can sit partially below your air units! Slim Profile - The slim profile of the stands means you'll barely notice them on the board! Varying Heights - 2 different heights to help differentiate between units or to create additional visual appeal to your game! Bring your game to a whole new level with these Metal Flight Stands from I Will Never Grow Up Games! Easily attach and detach your planes from the flight stand by using a single rare earth magnet glued to the belly of your plane! No need to deal with magnet polarity because the magnets will grab the metal of the flight stand all on their own! If desired, just drill a small hole in the bottom of your plastic plane piece and glue the magnet in place. Once it has dried you can quickly attach and detach your plane from the flight stand with ease, yet with a strong hold due to the properties of neodymium rare earth magnets. Each Set includes 100 Mini Stacking Chips with the Field Marshal "Star Logo"Included:70 Grey unit St.. Nothing tells your opponent that you have crashed through his defenses with yourPanzers better than ..